All content on this page is © copyright 2002 Mirame Media, Inc.
Mare: Who were your top two style writers and what were the differences between them? Kel: Noc 167, "Imperial Master Blaster" as he often tagged, which was rare but it did happen. Noc had an advanced wild style that had found its way to many across all the boroughs. He helped foster the development and adaption of ghost writers among the elite wild style artists. The styles Noc created enabled many of his "students" to embellish on their own personalities and spawned many independent identities. Part One, The Death Squad's grand master, who single-handedly planned the most elaborate takeover of any MTA line in history. He brought many top writers out of retirement to follow his crusade on the old Broadway line. Part helped reestablish many of the style masters in modern-day wild styles. Mare: You have had several of the best writers as piecing partners. Name two, and tell what you found unique about painting with them. Kel: Of all the writers I shared the iron sides with, the most impactful was Dondi. He had a sense of control and understanding that missed most. His attention to detail and fine lines separated his work from the pack. A signature trademark was the continuity he kept in his work when painting in groups of two or more. 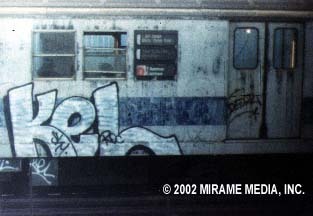 Min One; truly one of the most intense partnerships that pushed the envelope and help me define further my own approach to wild style. His insatiable appetite for perfection and total dominance in all of MTA's lines fueled my vision in the latter half of my career. We took the RRs by storm and left many whole cars to prove we were the force few writers could take on. Kel: The signatures of graffiti, the marks that get you noticed and help determine your place in the food chain. If your tag was weak you were immediately pushed to the back of the class and you took a whole lot of sh!t for it on the way. Mare: How do you define a good WildStyle burna? Kel: One that pays attention to the direction and shapes of the letters they create. The shapes make sense, the colors complement their message and the roaring train makes their presence felt. The lines and their connections lead the visitor on a ride as wild as the train they rode in on. Mare: What crews did you write for? This all changed of course after I had become a new force in the graffiti world. Once having established my presence in a world run by wild packs of writers, I was then invited formally and informally to become part of the larger world run by the elite artists. It didn't matter if I put up another clique or not. The fact that I hung and my presence was there within that group helped establish both me and them as premiere artists. Mare: What has life after the trains been for you? Why did you quit? And what did you do afterwards? Kel: At first, leaving trains posed several new challenges for me  one I had to figure out what I wanted to do with it (in terms of making a living) and if anything, I knew I wasn't interested in the gallery scene, so that was out. I still loved graffiti and the impact I had locally and globally. I wanted to follow up with something that I felt as creative with, so all of this led down a path towards the digital world we now live in. My departure had more to do with me personally evolving as a creative person and seeking new ways to stimulate that passion. Unfortunately, the new avenues of expression offered more compensation than fulfilling the creative side. This is something I still struggle with to this day in the world of clients and their objectives, which leaves no room for self-expression within the tasks developed for them. The focus still has some of the energy that once ran rampant on the sides of transit, except that now it's developed an intellect. So it makes its way into the work with an objective to its mark and an understanding of the world. Mare: Do you think you would ever lose your style, or is it ingrained? Kel: It's ingrained, it's a feeling I can't lose  I still see it in my mind and feel it in my scriptures. To lose it would mean I couldn't feel it anymore or see it. 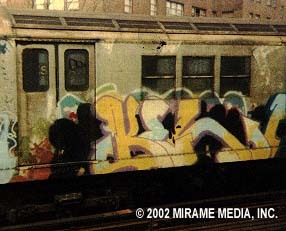 Mare: How do you view all this next generation of WildStyle art? Kel: They're more like fine illustrators than they are style masters or style killers. The work I have seen shows a great deal of control, add to that the high level of detail some of their illustrations have  it makes them ideal candidates for commercial work. In short, I like some of what I see but it's from a non-graff point of view. If I looked at it from a graff point, the art still ranks high, but I can't say the same for the lettering developed. Mare: What is your favorite bombing memory? Kel: Hitting Esplanade layup and having done a top-2-bottom end-2-end, and a half top-2-bottom, and three window-down wild styles. And then upon leaving the tunnel, I see two more wild-style whole cars I did with Cos 207 and Shy 147 laid up. Unfortunately, the pieces were crossed out. But still, in all, I had the most. (5 window-down whole cars and one-and-a-half top-2-bottom whole cars all done in the same week!). All new work with a group of about 12 top-notch writers coming out of the tunnel. Mare: How is bombing on trains relative to digital graff on the Web? Kel: It's not  we can't even bomb the Internet and get away with it  so the concept of relativity is non-existent. Digital graffiti will make anyone a legend if you don't read the history or find out about it on your own. The pervasive use of computers by underground artists will help them make a living of some kind without needing to go out and develop new personalities in order to fit again into society. It is both good and dangerous. There will be a lot of knock offs and fakes. We will see skills tested and pushed hard to exploit this new medium but without some kind of physical outlet and expression, it is dead. In short I see no connection with bombing and digital graff, unless you are going to start putting up 60-foot posters that cost hundreds of thousands of dollars to print and put out. Computers allow us to make changes in a world where they really don't exist. We can't go back and change the fact I used Cascade Green for a cloud on a car and now I want it to be Marlin Blue. It comes down to this … The computer has taken the place of paper and pen and sometimes paint. What we do with it can still be called graffiti if its true intentions are kept real.